It was so wet this weekend that Bearhands bucked the status quo and didn’t disappear into the paddock or the shed. I spent some time experimenting in the kitchen while he watched documentaries about people from the southern states of America catching, finding, shooting or brewing things. I’ve wanted to try making risotto using barley for ages, but I’ve been a bit hesitant – Bearhands is not a fan of ‘fruitatarian’ meals. Early in our courtship, I served an (admittedly pretty ordinary) vegetable risotto. Bearhands ate it all, then said “That was nice. Let’s never eat a meal without meat again”. Since then I’ve been mindful to feed the man meat. As I made the risotto he asked “so what are we having with this, Amanda?” I offered to cook him a side of chicken thigh, but he declined and with that we enjoyed our first vegetarian meal in nine years. Soak the pearl barley in water overnight. Chop the pumpkin into 5cm pieces,drizzle with olive oil and roast in a 180°C oven for 45 minutes or until cooked. In a heavy based pot, sauté the onion and garlic gently in olive oil until translucent. Add the drained barley, tomato paste and rosemary; stir. Increase the heat, add the wine and reduce by half. Stirring, start adding the stock and water – a ladle at a time, waiting until the stock is absorbed before adding more. When all the stock is absorbed, taste to check the barley is al dente – if it’s still too crunchy, add more water and continue until the barley is soft to bite. 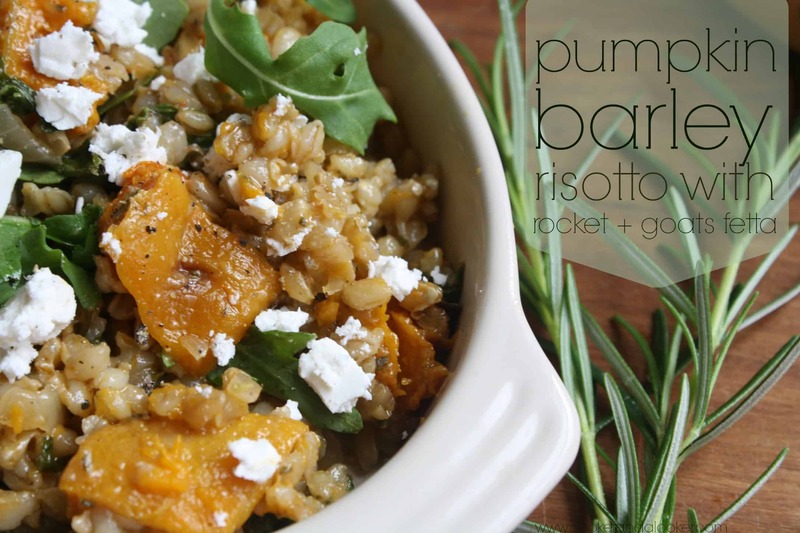 Add the pumpkin and rocket and stir into the hot barley to wilt. Serve with goats fetta crumbled on top. Pearl barley is about to be the new ‘superfood’, but there’s nothing new about it – it just went out of style for a bit. It’s filling, low GI and best of all it has a great nutty flavour. It met with Bearhands approval – he declared it “real stick to your ribs stuff”, which is high praise from a man who would normally have preferred sticky ribs. The family collaboration didn’t end there. The Little Sister decided to try her hand at food styling while I was taking the photos for this post. All the culinary greats have to defend their work with a bare foot while trying to snap a few photos of their creations on the floor next to the window; right Marco? do your kids ‘help’ in the kitchen? are you a herbivore or a carnivore? ever seen a show where the dialogue gets subtitles even though it’s in English? Looks and sounds delicious. I’m the only herbivore in my family, but I think this might be one that even hubby might like. Will have to try it over the weekend. Meanwhile, how cute is little sister?! Never thought of pinning recipes – what a great idea! Carnivore here! growing up we use to drink barley water as it was affectionately known but I have never cooked with barley before – might give it a go. We’re a demi veg household, the kids like meat, hubby is totally veggie – no fish, chicken etc – and I prefer veggie… and am inspired by my vegan friends who are fab cooks. I have a scarlet mushroom barley risotto recipe on my blog from one of them – slurp. This looks fab and am clipping to Evernote. And a quick PS, I so love cooking – with NO HELPERS!! yum yum yum…. this looks fantastic! I will have give barley a go. Just lately I have taken to eating more vegelicious foods. It doesn’t go so well with the family though. I have taken to putting plates on the floor to photograph before!! Just gorgeous Amanda! I love using barley, but yet to do so in a risotto – will be now!! Pinning this right now! We are a carnivorous household, but I’ve been wanting to add in some vegetarian dishes (though I’m sure my husband will have similar response to yours! ), so I’m thinking this looks a good place to start.